Mon., Feb. 11, 2019, 12:04 p.m.
LONDON – The British economy has not had a worse year since the global financial crisis and Brexit uncertainty is clearly to blame. The government even admits it. For 2018 as a whole, the economy grew by 1.4 percent. The last time it performed so weakly was in 2012, during Europe’s debt crisis. The last time it had a worse year was in 2009, when it contracted by 4.2 percent in the wake of the global financial crisis that brought much of the world’s banking system to its knees. Monday’s figures showed the slowdown gathering pace as the year came to an end. A surprise 0.4 percent contraction in December means the economy grew at a tepid rate of only 0.2 percent in the fourth quarter, down from 0.6 percent in the third quarter. Business investment fell at the end of last year for a fourth straight quarter– the first time that has happened since the financial crisis. With less than 50 days to go to Brexit day on March 29, firms have no idea what the country’s new trading relationship with the EU will look like, so they’re taking a safety-first approach that involves some relocating activities – and jobs – to continental Europe. Though Britain’s Treasury chief Philip Hammond argued that the British economy remains “fundamentally strong,” he conceded Brexit unease was taking its toll. While the British economy largely held up better than expected in the immediate aftermath of the June 2016 vote to leave the European Union, firms are getting edgier as Brexit day draws nearer – the government had expected to be ratifying a withdrawal agreement with the EU by now. There is no sign that the uncertainty, described as the “fog of Brexit” by the Bank of England, is going to lift anytime soon, so the economy is not expected to have improved at the start of this year. 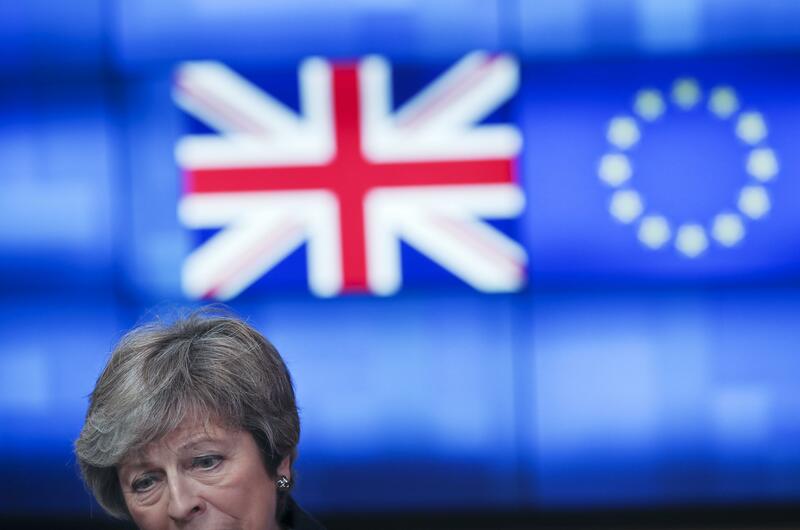 Prime Minister Theresa May is struggling to salvage the Brexit deal she agreed on with the EU late last year after it was overwhelmingly rejected by British lawmakers. She’s trying to eke out concessions from the EU, particularly on a controversial provision intended to make sure no hard border returns between EU member Ireland and Northern Ireland, which is part of the United Kingdom. It’s unclear she will be able to get any concessions and fears have grown in recent weeks that Britain could crash out of the EU without a deal. That’s a worst-case scenario that the Bank of England has said could see the British economy shrink by 8 percent within months and house prices collapse by around a third as trade barriers like tariffs are put up on EU-U.K trade. In 2018, net trade was a drag on the British economy as it imported more than it exported, a possible reflection of the waning effects of the prior year’s fall in the pound and a slowing global economy. “Today’s data bring clear signs that Brexit uncertainty is depressing the economy, but we would not rush to conclude yet that GDP is on track to fall outright in the first quarter,” said Samuel Tombs, chief U.K. economist at Pantheon Macroeconomics. Published: Feb. 11, 2019, 12:04 p.m.